ON THE GO OC - Things to do with your family. 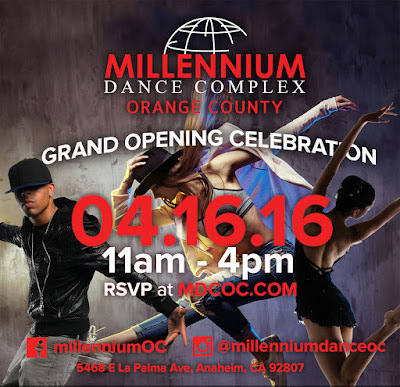 : Millennium Dance Complex Orange County Grand Opening This Weekend! Millennium Dance Complex Orange County Grand Opening This Weekend! Millennium Dance Complex Orange County is Coming to Orange County! Have you heard of Millennium Dance Complex? "The Millennium Dance Complex is known worldwide as the premiere studio of the commercial dance world and is widely referred to as a ‘the place where it all happens’. Although the studio’s A-list clientele and a faculty of the most sought after dancers and choreographers in the world has catapulted MILLENNIUM to a global brand, it still remains notably grounded, welcoming and dedicated to the highest level of service and instruction." The Grand Opening, off of La Palma in Anaheim, will include bounce houses, live DJs, a Magical T Dance Battle, photo backdrops, free classes all day, food trucks, and a lot more! Bring your family out to the fun and check out all the Dance Complex has to offer! Get all the details about Millennium Dance Complex and all their newest location in Anaheim here! Stay connected and up to date with all the details of the Grand Opening this Saturday here!